Tammy J. Stephenson, PhD, received her BS in Food Science and Human Nutrition and PhD in Nutritional Sciences from the University of Kentucky. She has taught a wide variety of food, nutrition, and wellness courses, including introductory nutrition, to majors and nonmajors in the Department of Dietetics and Human Nutrition at the University of Kentucky for the past 15 years. Dr. Stephenson is an active member of the Academy of Nutrition and Dietetics, serving as Chair of the Nutrition Educators of Health Professionals practice group. She has published and presented on service learning, technology in teaching, student-centered learning, and other related topics. Dr. Stephenson has a passion for teaching engaging, interesting, and relevant nutrition courses that has been recognized through multiple teaching and mentoring awards at the university, state, and national levels. Outside of the classroom, she enjoys running, yoga, coaching youth soccer, gardening, cooking, and spending time with her family. Wendy J. Schiff MS, RDN received her BS in biological health/medical dietetics and MS in human nutrition from The Pennsylvania State University. She has taught introductory foods and nutrition courses at the University of Missouri– Columbia as well as nutrition, human biology, and personal health courses at St. Louis Community College–Meramec. She has worked as a public health nutritionist at the Allegheny County Health Department (Pittsburgh, Pennsylvania) and State Food and Nutrition Specialist for Missouri Extension at Lincoln University in Jefferson City, Missouri. 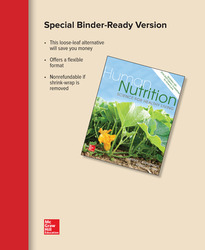 In addition to authoring Nutrition for Healthy Living and Nutrition Essentials: A Personal Approach, Wendy has coauthored a college-level personal health textbook and authored many other nutrition-related educational materials. She is a registered dietitian nutritionist and a member of the Academy of Nutrition and Dietetics.